Tapes on the Floor: Album Review: Errors "Have Some Faith In Magic"
Album Review: Errors "Have Some Faith In Magic"
If the veritable fanfare of grandiose guitars and synth which open "Tusk" make one thing very clear, it's that the Glasgow post-electro purveyors known as Errors have arrived. Or perhaps they've been here all along? The quartet's third and latest record, entitled Have Some Faith In Magic, is hardly their first foray into melding synth-pop inclinations with more progressive tendencies. Unheard here are the stylistic disparities which made their sophomore effort Come Down With Me an exciting, though often haphazard listen. 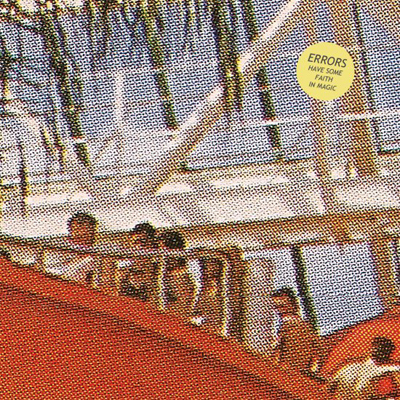 Still stuck somewhere between the dance floor and the rock hall, Errors have crafted a strikingly singular sound that is equally at home in either venue. Early single "Magna Encarta" grinds to life as varying electronic tones merge to form a moody, neon symphony, pierced by comparatively organic percussion and guitars. Distant vocals enter the piece as it descends into an 8-bit dungeon, with a stuttering chiptune lament punctuating the track's final crescendos. Elsewhere, the mechanized shoegaze of "Blank Media" wallows in woozy keyboards against a persistently shifting bass line. By the time the glittering intro to "Pleasure Palaces" kicks in, the record's dense, atmospheric course has been all but set. Fuzzed-out guitars wail as spectral voices rise amidst the sea of digital swells, all set against a relentless, pulsing beat. While the album's first half is far from conventional, its latter portion seems even more intent on maintaining an off-kilter sentiment. From the faltering detuned chords of "The Knock" to the alternately eerie and anthemic strains of "Cloud Chamber," the Scottish ensemble continually showcase an ear for strange yet tuneful compositions. These ethos are beautifully summed up in "Earthscore," a track which unfolds itself gradually as bubbling synths rubbing up against deftly manipulated vocals and thunderous stabs of bass. There's a palpable sense of experimentation present, certified by some truly strange musical moments which find inspiration in retro video game soundtracks and prog-rock indulgence. Have Some Faith In Magic is a record that feels unified by a group that has comfortably grown into a unique and innovative sound. Shepherded by post-rock forefathers Mogwai, the fellow Scots have managed to transcend preconceived genre classification and forge their own path. These electro sorcerers have delivered their finest effort to date—a record brimming over with hooks, intelligence and more than a little indescribable magic.